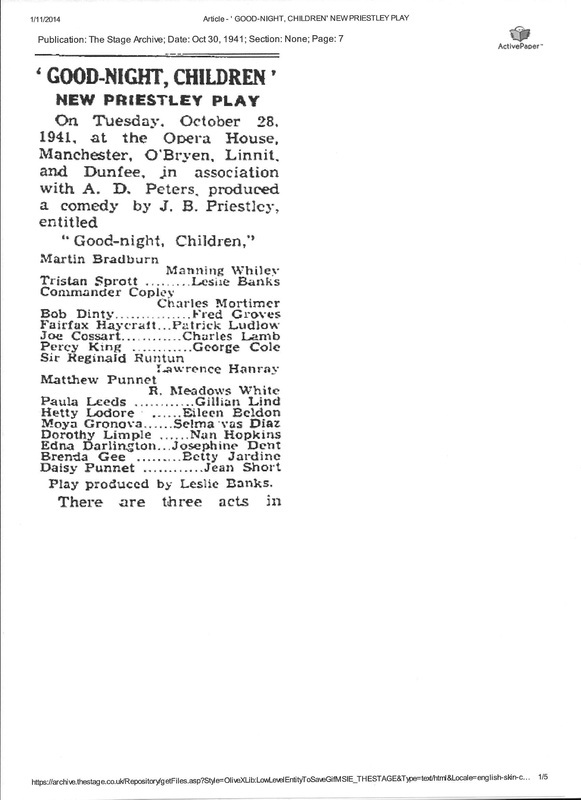 The Stage - 30 October, 1941. The Opera House, Manchester. The Stage. King's Theatre, Glasgow. "Humour is proportionately blended throughout and the neat cameos of Manning Whiley, Nan Hopkins, and Charles Mortimer are acceptable, as is the lively work of Jean Short and R. Meadows White." 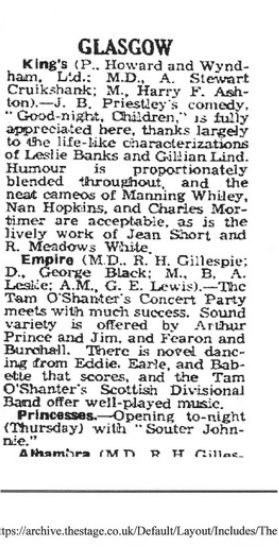 The Stage - 29 January, 1942. 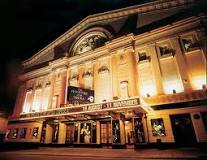 Theatre Royal, York. "Able support is given by Eileen Beldon, Lawrence Hanray, Fred Groves, Charles Mortimer, Eric Raymond, Manning Whiley, Patrick Ludlow, R Meadows White, Charles Lamb........"
ThE curtain rises on a stage setting for which the designer, Mr. Michael Relph, deserves a special round of applause. It represents a small broadcasting studio, and its hygienic spinsterdom —the desks, the chairs, the discreetly modernistic " wall-decoration, all setting off to perfection the brutal reality of the micro- phones and the effects paraphernalia—aptly sums up for us, in one quick glance, the mise-en-scene. But wait a minute ; an elaborate programme note disclaims any suggestion that the B.B.C. is here represented. This, we are told, is a mythical organisation known as the English Broadcasting Company, and this is one of its regional studios " in the remote county of Barset." In the first act Mr. Priestley parades before us a magnificent collection of-radio types—the frustrated and cynical producers, the announcer with a passion for the children's hour, the corteges of secretaries performing their mysterious rites, the actors and actresses trying vainly to equate their present shadowy existence with the past realities of perpetual touring companies, the cockney effects boy who cuts through the whole scented fake with a veritable nor'-easter of practical reality, and last, but not least, the pompous and utterly impervious executives. Indeed, as long as Mr. Priestley is interweaving all these characters in their various efforts to arrive at the evening's transmissions, the play is vastly entertaining, particularly since the ridicule is tempered by kindliness. But even in the first act there are perturbing indications that Mr. Priestley—for senti- mental if no other reasons—is determined to pair off most of his cast before the final curtain ; and as the play (which is in any case far too long) proceeds to its second and its third acts, the intrusion of a series of love affairs is continually bringing it down to the level of common or gardenia comedy, according to the social status of the various characters. It would perhaps have been wiser to have concentrated- purely on the radio aspects, and made it a nice tight little curtain-raiser. 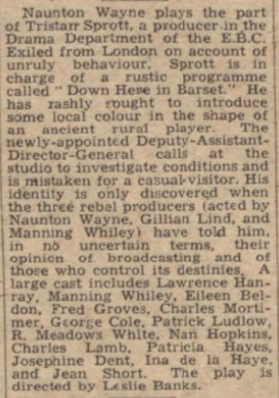 As it is, the story of Tristan Sprott's effort to produce a Barsetshire programme, with genuine local colour in the shape of an aged yokel who can play the serpent, is held' up again and again by the by no means interesting personal affaires of the various characters. True that the more intellectual of them manage, during their love-making, to deliver pretty long harangues about the frustrations and miseries of the creative artist, caught in the toils of the " English Broadcasting Com- pany " ; true, also that in the said harangues he strikes some shrewd and deserved blows against bureaucracy and the old school tie ; yet all this belongs to a different play, one which should be completely serious or savagely satirical. Mr. Priestley, in fact, has tried to inflate a not unattractive football to the size of a barrage balloon, and has failed for want of breath. 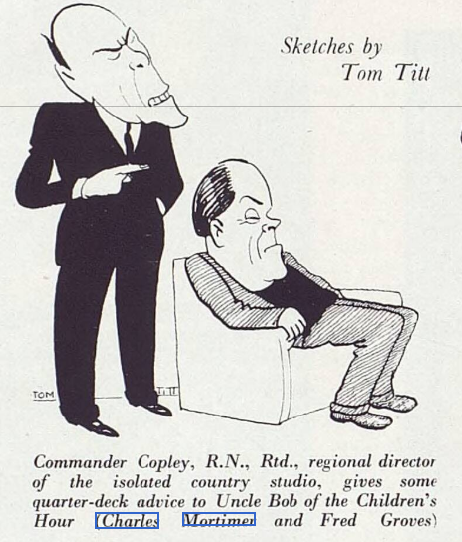 "Nevertheless, the three outstanding performances are by Charles Mortimer, as the local bureaucrat, magnificently unassailably retired R.N; by R Meadows White, as the recalcitrant serpent player who makes Churdles Ash look like a "straight" part; and by George Cole, who gives a virtuoso performance as an effects boy required with the minimum of equipment to produce the continuous noise of conviviality in a Barsetshire pub." George Cole. In the collection is a letter from George Cole written in 2014, remembering working with Charles Mortimer, in the 1940's. George went on to have a long career in films, theatre and television, such as the "St Trinian's" films, and "Minder". Naunton Wayne, who also appeared in such fims as "The Lady Vanishes" and "Night Train to Munich", in both films playing the part of Caldicott. In the collection, is a letter of condolence written to Charles Mortimer and Greta Wood, following the death of their RAF son, Basil. 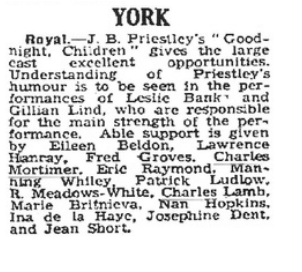 Article from the Yorkshire Post of 9 December, 1941. Article from the Aberdeen Press and Journal, 20 December, 1941. Advert from the Yorkshire Post of 21 November, 1941. From the Yorkshire Post and Leeds Intelligencer 26.11.41. 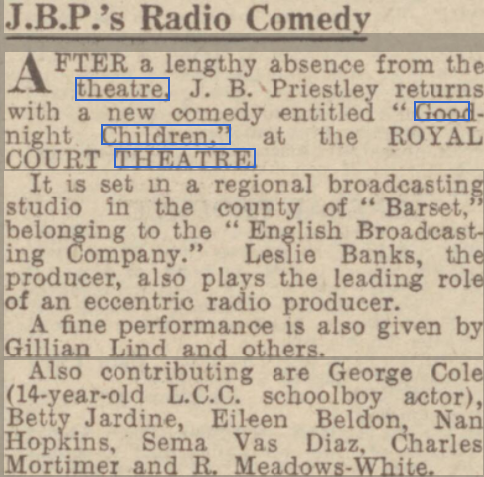 Some of the best humour is in the attempts to drill local rustics in the art of broadcasting, and in the work of the effects boy (George Cole). Gillian Lind, Leslie Banks and Manning VVhiley are outstanding in excellent cast for their brilliant work the three producers. Fred Groves and Eileen Beldon bring amusing conviction to temperamental studies of an Auntie and Uncle of Children's Hour who are always quarrelling, and others who are responsible for fine team work in a cast too numerous to mention in more detail are Charles Mortimer, Patrick Ludlow, Josephine Dent, Betty Jardine, Nan Hopkins. Selma Vas Diaz, and Lawrence Hanray. From The Banbury Advertiser of 12 November, 1941. A new play from the pen of J. 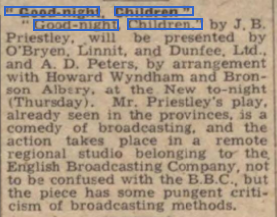 B. Priestley is a theatrical event of the first magnitude, and unusual interest attaches to the production of “Goodnight, Children,” which comes to the New Theatre, Oxford, on November 17th, prior to the West End. For Mr. Priestley, one of the great national figures of broadcasting, has written the first play to deal exclusively with broadcasting. As might be expected, he has many pungent and amusing jokes at the expense of radio organisation and red tape, with some uproariously funny situations and brilliant acting by a very strong company headed Leslie Banks. 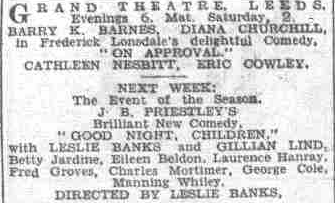 Leslie Banks appears as Tristan Sprott. an impetuous and somewhat ececntric producer in the drama department of the English Broadcasting Company, known as the E.B.C. Gillian Lind and Manning Whiley appear as two other rather rebellious producers. 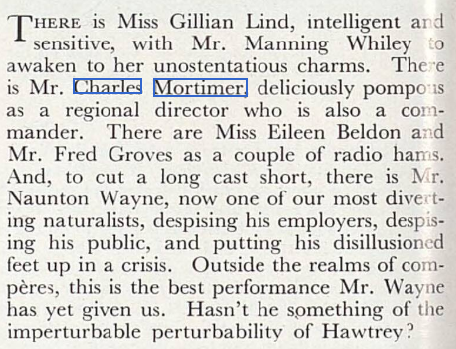 Other important parts are played Charles Mortimer, Fred Groves. Patrick Ludlow, B. Meadows White, George Cole, Eileen Beldon, Betty Jardine and Selma Vaz Dias. 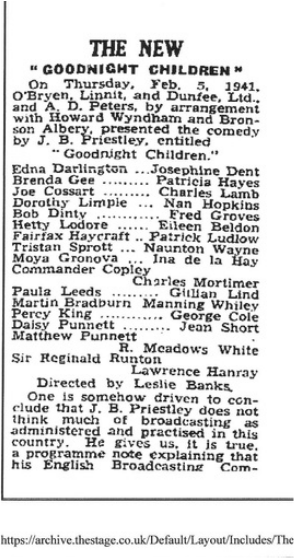 "Goodnight, Children,” is directed Leslie Banks, and presented by O Bryen, Linnit and Dunfee, Ltd., in association with A. D. Peters. From The Scotsman of 16 December, 1941. Mr J . 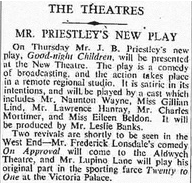 B . Priestley s new three-act comedy , "Good-night, Children", was presented last night in the King's Theatre, and warmly received. 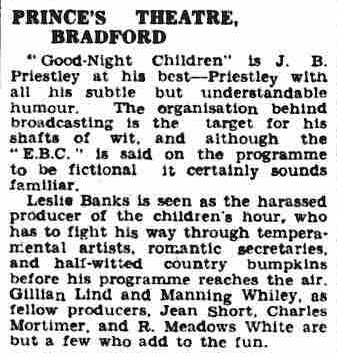 Mr Priestley is not content with poking fun at this "nice easy-going machine" of broadcasting . Through one of the players he expresses dramatically his own feelings about cutting red tape binding the machine . Several of the company in "Cottage to Let", recently seen in the city, appear in the cast, and make a grand-team . Leslie Banks , Gillian Lind, Charles "Mortimer, Eileen Beldon, and Manning Whiley are outstanding . From The Newcastle Evening Chronicle - Friday 06 February 1942. 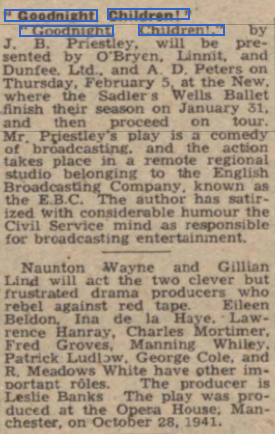 From The Stage - Thursday 05 February 1942. From The Liverpool Evening Express - Saturday 01 November 1941. From The Stage - Thursday 22 January 1942. 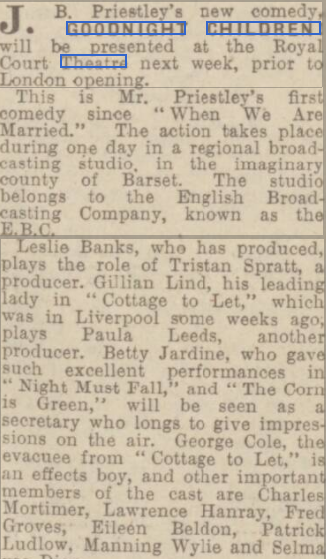 From The Liverpool Evening Express - Friday 31 October 1941.